Under President Donald Trump, the White House will have new carpets, chairs with clawed feet, and plenty of golden eagles for decorations. The White House has been troubled by leaking fixtures and an infestation of flies according to CNN. During his time as Chief of Staff, Reince Priebus was reportedly summoned by Trump to kill a fly in the oval office. 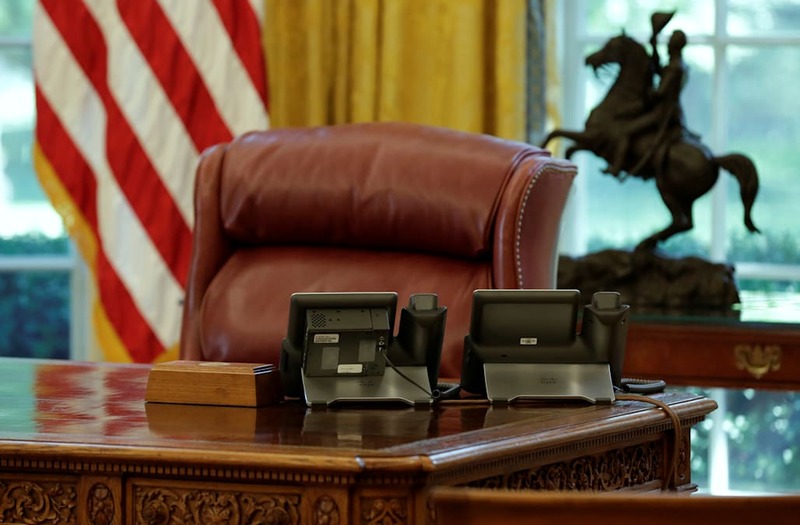 The technical renovations, which were initiated under President Barack Obama, included upgrades the White House's heating, ventilation, air-conditioning system, and IT systems along with a major rehaul of the Oval Office, West Wing, mess hall, and outdoor spaces. Many of the rooms are also undergoing stylistic renovations to better fit Trump's personal decorative preferences for a "patriotic" look. As part of the renovations, decorators changed up furniture, wallpaper, rugs, and statues in some of the White House's most prominent rooms. The new look, which was based on Trump's personal preferences, took three weeks and nearly 200 workers. Trump was the one to pick out the new wallpaper for the Oval Office. But the pièce-de-résistance were the golden eagles throughout the West Wing — they are supposed to symbolize Trump's patriotic side. Journalists who attended the tour shared photos of the golden eagles on social media. Even though Trump was living at one of his golf resorts during the renovations, he was at the Oval Office on August 22. By contrast, much of the wisteria around the White House's South Portico was trimmed or cut entirely. "[Mr. Trump] wanted to bring back the luster and glory of the White House," one White House official said. But as Trump is currently designing his own floor covering, it is possible that the look of the Oval Office will change again.